In Rooms Facilities are: Attached Nice & Clean Bathroom, Towel, Tea Table And Chair, Room Service, Free WIFI Access and well decor rooms within your budget. Well Trained Staff to make your stay memorable. The hotel is near Pushkar Lake and the Pushkar Camel Fair Ground. There is also a rooftop restaurant that gives the beautiful views of mountains and the Camel Fair Ground. The Main Market is just at the walking distance from the hotel. Payment upon arrival by cash. Credit card isn’t accepted. Great location. Close to town but far from noise. Really friendly and chill staff. Great food, we ate here more than eating out. Do their best to accommodate any requests you have, get you what you need. Good showers, comfortable beds, good WiFi, and great value. No problem extending our stay. Would stay here again, definitely. This is a gorgeous little hotel with an excellent rooftop cafe / hang out area (very cheap good food!). The owner is lovely, he will do everything to make you feel at home, including organising transport and tours for you, he’s super chill and friendly and nothing is too much trouble. Good relaxed social place. Rooms are great. Highly recommended. 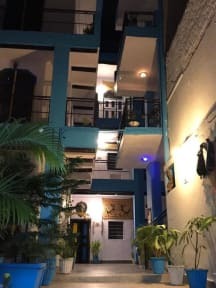 I highly recommend this guesthouse first and foremost because of the amazing staff. They are super caring and available all hours for every request, uncomfortable for them as it may be. They literally took care of me in the middle of the night when I had fever with grace and a smile. Its really nice and quite, calm vibe if you're looking to relax. The place is clean and its just 5 minutes away from the main market Rd. My recommendation for this property is due to Staff/manager. They are very kind,helping and interactive. They helped me in all possible way they can.